Comilla Victorians reached a point in their BPL campaign where they could not come up with a proper playing XI due to injuries and premature player exits. They however rode out the difficulties and their rickety bunch lifted the trophy after winning a dramatic final. Ashar Zaidi, Imrul Kayes and Abu Hider led the way, firmly backed by captain Mashrafe Mortaza, who it seemed could do no wrong in this campaign. 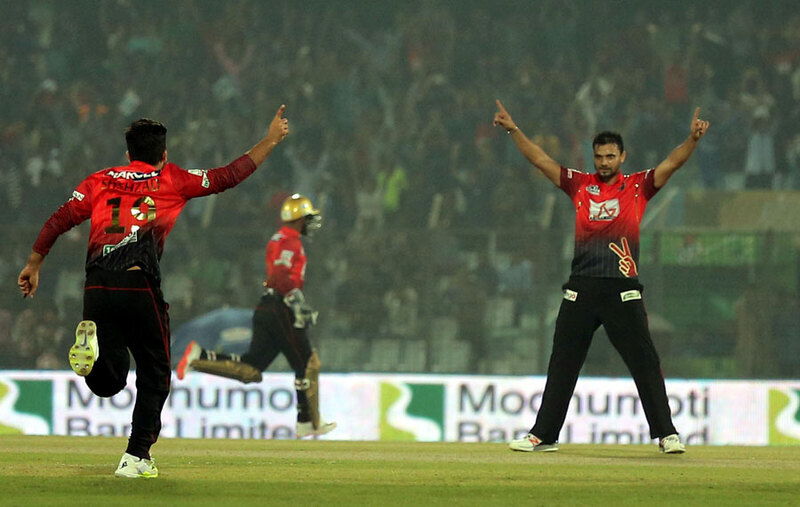 Their coach Mohammad Salahuddin said ahead of the final that it was Mashrafe's unbeaten 56, which he made after unexpectedly promoting himself to No 5 against Chittagong Vikings in their second match, that ignited the Comilla side. Mashrafe played the latter half of the competition with a hamstring tear which limited him to a standing position at the field, either at cover or midwicket. The owners simply wanted him to be at the ground, because they did not have a leadership figure within the squad who could take his place. In those matches it was Zaidi and Hider who shone the brightest, regularly attacking with bat and ball. Imrul too scored important runs while Shoaib Malik, Marlon Samuels and Shuvagata Hom chipped in regularly. Samuels and Sunil Narine exited Comilla one after another, the former having to join West Indies in Australia and the latter getting banned from bowling. Comilla brought in Dolar Mahmud as a back-up seamer but he damaged his shoulder in his first game. Mashrafe bowled off a short run-up in a few matches, including the final. And it was finally Alok Kapali, a late call-up in the Comilla side and someone considered well past his use-by date, who got them home in the final. Big and small performances helped Comilla throughout their campaign, and they gained fans not only from their region but also across the country. Comilla had a number of excellent team performances including the BPL final, but to get there they had to cross a strong Rangpur Riders in the first Qualifier. The 72-run win was their best performance in the tournament with runs Kayes making 67, Hider taking his second four-for and Zaidi winning the man-of-the-match award with an unbeaten 40 and 4 for 11. Luckily, Comilla's lowest point came in their first game, on the BPL's opening night, when they were soundly beaten by Dhaka Dynamites. Their top and middle order collapsed quickly and it was only their bowling that Mashrafe could talk about later. Now it seems like the six-wicket drubbing was the perfect result to motivate Comilla for the rest of the campaign. Ashar Zaidi was adjudged man-of-the-tournament, more for his match-winning performances than for his 215 runs and 17 wickets. He was a surprise performer for much of the BPL's audience who would have never heard of him before this tournament. Comilla owe much to Zaidi, who got them through the tough terrain of the league and qualifier stage. Liton Das was a big disappointment given how he was talked up by most of his Bangladesh teammates. A poorly thought-out shot to Mohammad Sami in the final summed up his campaign, which saw him make only 123 runs in nine innings. His wicketkeeping, however, was quite impressive. The Comilla team management was lauded for their professionalism and man-management skills and they should hold on to this approach for the next season. Players were happy to be paid before deadline date, which also helps the BPL's image. If their smooth backroom ways continue next year, they will be quite a popular franchise with the players.